Ospreys chief Andrew Hore has accused the Welsh Rugby Union (WRU) of breaking an agreement not to negotiate a central contract with Wales prop Adam Jones. The region have offered the 33-year-old a new deal but Hore claims the WRU have been discussing terms with Jones. "We are still waiting to hear back from Adam. The ball is in his court," he said. The WRU says it is important everyone "works together" to keep Jones in Wales. Jones was one of six players the WRU highlighted, whose contracts were due to expire that they would like to stay in Wales. Leigh Halfpenny will be playing his domestic rugby in France for Toulon in the 2014-15 season. Blues and Wales full-back Leigh Halfpenny is the only one of the six to opt to move away from Wales - having signed a contract to join Toulon for the 2014-15 season. Meanwhile, Rhys Priestland and Scott Williams have agreed new deals with the Scarlets, and Alun Wyn Jones has opted to stay with Ospreys. Only Welsh captain Sam Warburton has agreed a national contract with the union. British and Irish Lion Jones, who is contract with Ospreys ends in May, has previously said he will probably stay in Wales. Ospreys chief executive Hore says the region received an email on 12, February from the WRU stating that the union would "not compete with" them to sign Jones. "We subsequently discovered they were continuing to negotiate with him," said Hore. 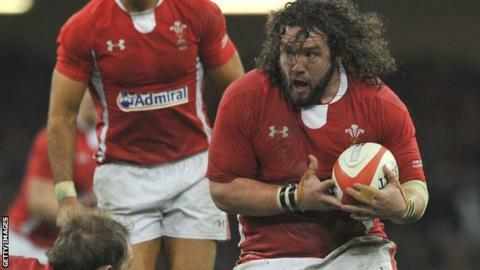 "Adam Jones has been a faithful servant of Welsh rugby and continues to be a world class player. "It is important we all work to ensure he continues his rugby career in Wales." "The WRU continues to seek a solution with the four Regions to retain Welsh players in Wales."